‘There should be strong punishments for racism’ says the FIFA President. Sepp Blatter speaks during during a press conference in Tokyo on Saturday. The fine was handed out following the violence and racist abuse that marred the country’s Under-21 match against England in October. In addition to the fine, four Serbia and two England players received bans from UEFA, two Serbia coaches were handed two-year suspensions and the hosts were also ordered to play their next game behind closed doors. Despite those sanctions, UEFA have come under intense criticism because of the severity of the fine, with many drawing comparisons with the 80,000 pounds that Denmark striker Nicklas Bendtner was charged for displaying prohibited sponsored underwear after scoring a goal at Euro 2012. “There is zero tolerance for racism, if you look at our disciplinary committee’s decisions,” Blatter said at a press conference in Tokyo. “I have no comment on UEFA’s decision. There should be strong punishments for racism. “I don’t know details of fine but I will talk to (UEFA president Michel Platini); I don’t know if he has influence on his disciplinary committee, but I will ask details on the fine. Blatter was speaking ahead of the final of the Club World Cup in Yokohama, where two systems of goal-line technology – Hawk-Eye and GoalRef – are being trialled. He explained that one of the systems will be used at the Confederations Cup in 2013 and promised that technology would be in place for World Cup 2014 in Brazil. “We’ll make an assessment after tomorrow, but the referees are happy,” he said. “We won’t take both to the Confederations Cup but one will be used there and in the World Cup. “We have put it on ice until we had a system that is accurate, and what has happened? In (World Cup) 2010 (Frank) Lampard had a wonderful kick and the kick ended at least 70cms behind the line but the officials couldn’t or wouldn’t see it. 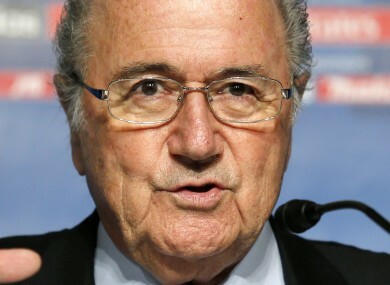 Email “Blatter plans Platini talks on Serbian fine”. Feedback on “Blatter plans Platini talks on Serbian fine”.